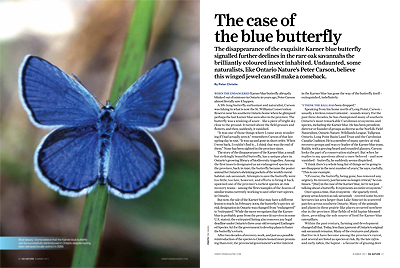 The disappearance of the exquisite Karner blue butterfly signalled further declines in the rare oak savannahs the brilliantly coloured insect inhabited. Undaunted, some naturalists, like Ontario Nature’s Peter Carson, believe this winged jewel can still make a comeback. When the endangered Karner blue butterfly abruptly blinked out of existence in Ontario 20 years ago, Peter Carson almost literally saw it happen. A life-long butterfly enthusiast and naturalist, Carson was hiking in what is now the St. Williams Conservation Reserve near his southern Ontario home when he glimpsed perhaps the last Karner blue seen alive in the province. The butterfly was a winking of azure – like a piece of bright sky close to the ground. It turned above the field grasses and flowers, and then, suddenly, it vanished. “It was one of those things where I came away wondering if I had actually seen it,” remembers Carson of that late spring day in 1991. “It was up and gone in short order. When I went back, I couldn’t find it … I think that was the end of them.” None has been sighted in the province since. The story of the disappearance of the Karner blue, a small but strikingly beautiful butterfly, has a unique place in Ontario’s growing library of biodiversity tragedies. Among the first insects designated as an endangered species in the province, back in 1990, the butterfly became the poster animal for Ontario’s shrinking pockets of the world’s rarest habitat: oak savannah. Attempts to save the butterfly were too little, too late, however, and efforts to bring it back spawned one of the province’s earliest species-at-risk recovery teams – among the first examples of the dozens of similar teams currently working to save other rare species in Ontario. But now, the tale of the Karner blue may have a different lesson to teach. In February 2009, the butterfly’s species-at-risk designation in Ontario was changed from “endangered” to “extirpated.” While the move recognizes that the Karner blue is probably gone from the province (it survives in some U.S. states), the extirpated listing also removes any legal deadline under Ontario’s three-year-old revamped Endangered Species Act for the government to develop plans to foster the butterfly’s return. After two decades of recovery work, and just as a possible reintroduction of the species to Ontario looked more promising than ever, the provincial government’s active interest in the Karner blue has gone the way of the butterfly itself – extinguished, indefinitely. 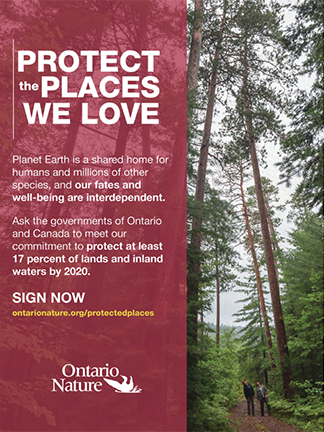 Fourteen plants and animals designated as “extirpated” in Ontario have not been spotted here for years but continue to live in other places. For some, just one or a few historic records exist, after which the species has never been found in the province again. More recent additions, however, signal biodiversity loss that, in some cases, might be reversed – that is, if the extirpation designation did not effectively sideline efforts to bring them back. Incurved grizzled moss (Ptychomitrium incurvum): This small moss, often found in deciduous woods in southeastern United States, was discovered in Ontario just once, on a lone boulder near Niagara Falls in 1828. Illinois tick-trefoil (Desmodium illinoense): With white or pink flowers, the Illinois tick-trefoil once grew in southwestern Ontario’s now-dwindling areas of tallgrass prairie. It was last seen in 1888. Spring blue-eyed Mary (Collinsia verna): This small, attractive wildflower once grew in wet woodlands in southern Ontario. The species has been gone from the province since 1954, lost to forest clearing and farming. Eastern tiger salamander (Ambystoma tigrinum): Regularly found in many other places across North America, the eastern tiger salamander was last seen in Ontario at Point Pelee in 1915. Eastern persius duskywing (Erynnis persius persius): Last seen in Ontario in 1987, the eastern persius duskywing belongs to the triumvirate of lupine-feeding oak-savannah butterflies – along with the Karner blue and the frosted elfin – that disappeared from the province when their beleaguered habitat could no longer support them. Karner blue (Lycaeides melissa samuelis): Gone since 1991, the Karner blue is the most spectacular – and has the highest profile – of any of Ontario’s lost oak-savannah butterflies. Gravel chub (Erimystax x-punctatus): The small, bulgy-eyed minnow was found exclusively in the Thames River system near London before vanishing from the province in 1958. Atlantic salmon (Lake Ontario population) (Salmo salar): The native strain of Atlantic salmon once found in Lake Ontario disappeared in 1898 and is now considered extinct by the Committee on the Status of Endangered Wildlife in Canada. Despite this, fishermen’s fondness for the species helped spur a salmon reintroduction program that has continued, with mixed results, since 2006. Paddlefish (Polyodon spathula): This prehistoric-looking creature with a long, flattened snout disappeared from Ontario’s Great Lakes and rivers after 1917, possibly due to overfishing and dams. Frosted elfin (Callophrys irus): Ontario’s only site for frosted elfin butterflies was the oak savannah found at St. Williams, north of Long Point. In 1988, the species followed the eastern persius duskywing into obscurity. Spring salamander (Gyrinophilus porphyriticus): Ontario’s last known spring salamanders – a lungless species found in Quebec and in the Appalachian Mountains of the United States – were fished from a stream as larvae near Niagara Falls in 1877. The only other record is from the Ottawa area. Timber rattlesnake (Crotalus horridus): The timber rattlesnake inhabited the rocky Niagara Gorge and escarpments as far north as Georgian Bay until it disappeared in 1941 – probably a victim of intensive persecution. Eskimo curlew (Numenius borealis): No one knows if the Eskimo curlew ever nested in Ontario. After the late 1800s, the once-numerous shorebird was hunted almost to extinction. The last sighting in the province was at James Bay in 1976. Greater prairie-chicken (Tympanuchus cupido): This bird colonized southern Ontario grasslands in the 1800s before farming led to the loss of suitable habitat. The species was last seen in the province on Manitoulin Island and in the Sault Ste. Marie area in the 1970s. “I think the ball has been dropped.” Speaking from his home north of Long Point, Carson – usually a tireless conservationist – sounds weary. For the past three decades, he has championed many of southern Ontario’s most remarkable Carolinian ecosystems and species, including the Karner blue. He has been president, director or founder of groups as diverse as the Norfolk Field Naturalists, Ontario Nature, Wildlands League, Tallgrass Ontario, Long Point Basin Land Trust and the Carolinian Canada Coalition. He is a member of many species-at-risk recovery groups and was co-leader of the Karner blue team. Ruddy, with a greying beard and rounded glasses, Carson looks the part of a conservation stalwart. But when he replies to my questions about a once-beloved – and now vanished – butterfly, he suddenly seems dispirited. 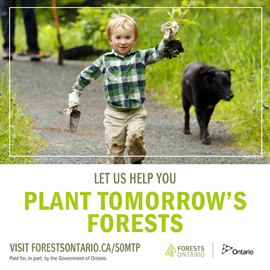 We have a red oak savanna of about 20 acres at De Grassi Point near Lefroy on the west shore Cook Bay, Simcoe County, that we are trying to rehabilitate with the help of MNR through occasional burnings. Among the many savanna species we don’t have lupines, possibly because of the deer. Is it possible to introduce them to attract the Karner blue? My grandfather (later Prof. E.M. Walker) recorded the Karner blue in a letter to his mother (1892) calling them Lycaena. Unfortunately he did not write where he collected it but he was at De Grassi every summer after 1890. He was then 15 yrs. Conrad Heidenreich. This is really important information about all these lost species. Thanks for the great article. I will be sure to pass it around to everyone I know in southern Ontario. I have always been worried about the industry on our Great Lakes. Proof positive corporations and governments aren’t doing enough to save our water. We had better unite and get busy FAST. Based on the historical Carolinian and Boreal range of the wild lupine in Ontario, it appears that De Grassi Point is out of both the Carolinian and Boreal range. Therefore, I believe that DeGrassi Point would be out of range to plant wild lupine within the context of its historical distribution – unless local naturalist clubs or botanical experts could positively testify that wild lupine existed within the DeGrassi Point area. However, it is possible that your grandfather had seen the Karner blue butterfly in your local red oak savannas! I recently came encounter with a very little baby blue colored butterfly, i have never seen a butterfly such as it. I have been searching for help to identify the butterfly and its meaning of color. I have a beautiful picture of it, along with a wonderful, unbelievably, miracle story with it. If interested,please send me an email. Thank you, I look forward to your response.